Nelson and Nelson Antiques is pleased to announce that we have recently acquired a gorgeous and rare Tiffany tea and coffee set from circa 1910. A rarely seen set sure to be treasured for generations by the right collector. 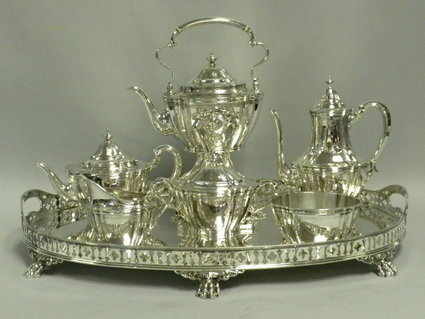 Oct. 2, 2010 - PRLog -- This elegant 7 piece tea and coffee service by Tiffany & Co., New York, was made circa 1910 in the English Edwardian style. The set includes a coffeepot, teapot, kettle on stand with burner,l covered sugar bowl, creamer, waste bowl and a beautiful Tiffany & Co. paw footed pierced gallery tray in a complimentary style, circa 1905. The tea and coffee service is fully hallmarked with Tiffany & Co., makers, sterling silver 925/1000, "m", and pattern #B16479. The set is beautifully hand finished and is engraved with a floral and fauna wreath-like motif accentuating each section of each piece. The tray is hallmarked with Tiffany's full complement of hallmarks, pattern #9038 and "C" for pieces made between 1902 and 1907. Although the tray is not an exact match to the set, it is one of the best Tiffany pierced gallery trays we have ever seen on the market and it enhances the set beautifully. The complete 7 piece set is in excellent condition. The tray measures 24 5/8" by 19 3/8". The coffeepot is 9 1/2", high and the kettle on stand is 13 5/8", high overall. The entire set weighs 315 troy ounces. The price of $27,500 is a real steal. Nelson & Nelson Antiques showcases a treasure-trove of late 19th & early 20th Century antique silver, sterling silver: candle sticks, picture frames, trays, tea sets, hollowware, flatware, vanity items, French antiques and silver overlay.